You'll find some incredible deals on Pearls in this section! Every week something new is added to our Clearance Pearls, so check back often. Our Pearls are graded A, A/B, B, B/C or C quality; A being the very best quality, while C, would be medium quality. All measurements are done by the width of the Pearl. Our Pearls are strung on temporary strands and should be re-strung before wearing. 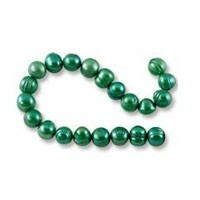 Please see our selection of Carded Bead Cords to find a color right for your selection of Pearls.